Here is your Angel Card Reading/Channeled Message for the week of December 19. As always, I asked the angels to please give me a clear reading and message for you, my students, clients, and followers. 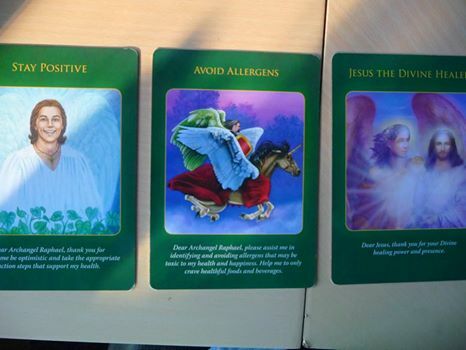 For this reading the angels took me directly to the Archangel Raphael Healing Oracle Cards by Doreen Virtue, how intriguing! This is one of my favorite decks <3 3 card pull they tell me. And Oh My. What a powerful reading this is as we move into the week of Winter Solstice, Christmas, and Hanukah! The first card they have for you this week is STAY POSITIVE. If ever there was a week for this card, this is surely it! With this card we are being reminded by Archangel Raphael, the angel of healing, to be optimistic and to act in healthful ways in this, our big run up to the holidays week and holiday weekend. Staying positive and optimistic about your day to day happenings will help you balance the stress of this time of year. Being optimistic about the little things really will help. A LOT. the angels say. So give it a try! What next small happening, chore, or event could you feel optimistic about right now, beloved one? The second card is AVOID ALLERGENS. With this card, Archangel Raphael asks the you ask him to please help you to only crave healthful foods and beverages, an interesting challenge for this week to be sure! If you need help with this, please do ask your Guardian Angel and Archangel Raphael to surround you with their loving, calm and soothing vibrations. They will help you get through whatever is coming your way this week. And finally, Card #3 is, I kid you not, JESUS THE DIVINE HEALER. The prayer message of this card is: “Dear Jesus, thank you for your Divine healing power and presence.” Thank you, Jesus, ascended master and ascended healer, for being with us on this day and all days. Jesus is quite non-denominational – he is pure love and highest vibration energy. I was quite timid myself about connecting with the energy of Jesus as this is not my faith, but he has made his healing available to others through me, and I am grateful indeed. Jesus and Archangel Raphael are asking me to let you know that you, too, can tap into the energy of unconditional love he is offering you, right now. Just open your heart and allow the energy to come in. December 24th, which, this year, is both the first night of Hanukah, the Festival of Lights, and Christmas Eve, will be combining the prayers of many millions of people around the world in one powerful vortex of energy. It would be a good time to join in with the collective, to pray for peace and healing for your self, your family, your loved ones, your community, the earth, the animals and birds, the water and land and trees, nature, and the all that is (and for anything or anyone else you want to pray for, of course). Give and take of the collective uplifting prayers on 12/24, beloved ones. The energy is going to be right there for you. Why not join in? You are so loved. I wish you deep peace and joy this week, as do the angels. Remember – they are always available for you – you just need to ask them to help, and there they will be! Holding a space for peace.